In April I did a comprehensive blog post about the Html.EditorFor() and Html.DisplayFor() helpers in MVC 2, and there use with templates. It turns out I missed quite a cool feature added in the MVC 2 RTM release in March. 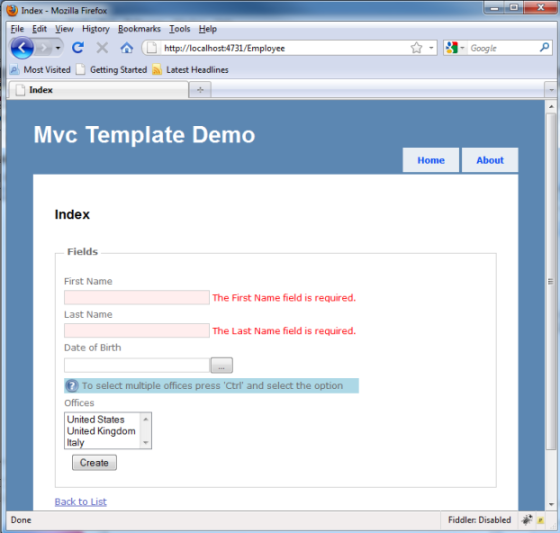 ASP.NET MVC 2 now includes new overloads of the EditorFor and DisplayFor methods. These overloads contain a parameter that accepts an anonymous object that can be used to provide extra view data. The view data provided in this parameter is merged with any existing view data that is passed to the template. This new overload is very handy for providing additional information to your template without any nasty hacks. In this post we are going to continue our Employee example from my MVC Templates and MVC Model Binders posts, we will change the code to make use of the new overload. For this example we have been asked to add the functionally to optionally supply help text for our Offices Select field. The template will be used by different views in the near future, and therefore the help text will have different meanings depending on what view is using the template, so we can’t hard code it. Change the Index view (\Views\Employee\Index.aspx), so that the call to Html.EditorFor for Offices passes an anonymous object specifying the help text for the Select input field. Next we need to change the Offices template (\Views\Shared\EditorTemplates\Offices.ascx) to handle the additional view data. Adds the anonymous object to the ViewData dictionary, using the property name as the key and the property value as the value. Understanding the template helper’s additional ViewData overload should help you avoid those view hacks that we all do from time to time. When using this be careful not to break separation of concerns, for example passing some information to configure the display of a view is correct use of this functionality, creating a new model in a view and passing it to a template breaks SoC and should be avoided. The example code in this post and download use .NET 4.0 and Visual Studio 2010. If you would like me to add a .NET 3.5/Visual Studio 2008 download post a comment. Nice post, I d like to know how many changes it involves for usage with the version .NET 3.5/Visual Studio 2008. Can you provide some inputs on how to use Radio Button List in MVC2? Can you do this example in razor please, I am having problems trying to use the additional data, I am praying I havent run into a bug, I have tried several ways to do this in razor. Very energetic blog, I lovved that a lot. Will there be a part 2?